At the grocery store I recently paid for $92 worth of groceries. I asked for $60 cash back on my purchase. The cashier froze, paused and stammered “Ok, soooo…. How much will that be?” The bagger saved the day and helped with the math. How many math questions can you do quickly, in your head (NO calculators, please!) Leave your answers in the comments, below. In practical ways, simple, mental math means almost instantly knowing the answer – in your head – to questions like 92+60. There are practical reasons. When you’re at the checkout it’s nice to verify that the cashier is giving the correct change, quickly, without the need of a calculator. Mistakes happen more often than I’d like to think. In a bigger life context mastering mental math is useful to everyday tasks. … Or figuring out how much it will cost to take 8 kids to a birthday party movie at $8 each plus snack pack of $4. In the classroom, mental math is crucial for higher level math. I’m not talking about 3rdyear university calculus. Word problems and bigger concepts will suffer if all the student’s mental energy revolves around simple math calculations. What do we do to help our children? 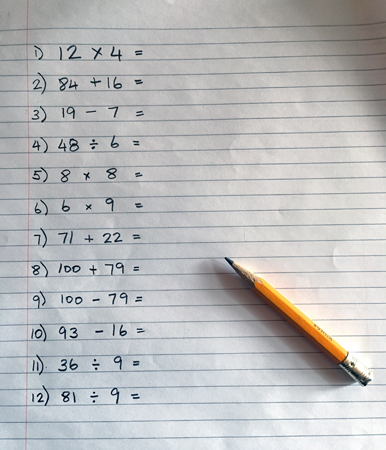 I believe it is important for students to learn simple math by rote… so that the answer to 92 + 60 is automatic. They should learn simple math including times tables by memory. How can students acquire this knowledge? It’s not fancy. Practice. In elementary classes I do short “Mad Mental Math” by placing 20 simple math questions around the room on “vertical, non permanent surfaces”. I encourage students to work quickly, support each other. There are no calculators allowed! It’s exciting, fun and involves all levels of math students. I’ll also do a game-show style quiz where students answer simple math questions verbally or on paper. It’s lightning fast, a little crazy and fun. For both activities, we go over the answers as a class and ask students to explain strategies they found useful to figure out the answers. • National Research Council. (2001). “Adding it up: Helping children learn mathematics.” Washington, DC: National Academies Press. (page 351) – sourced from “Focusing on the Fundamentals of Math: A TEACHER’S GUIDE,” below.